"In the Bible, it says that God invented the universe in seven days," I started. "But there was actually an eighth day, and on this day God created all the strange things that have no purpose other than making life more awesome." "On the eighth day God invented the sound of rain and electricity. He invented roses and tattoos of roses. He invented city beaches and goldfish. He invented spots on cheetahs and made the legs on women longer than they needed to be. He invented trumpet players and haikus. He invented tiny old men that serve espresso, and wild flowers in abandoned lots. He invented constellations and neon lights. He invented being ticklish and exaggerating. He invented snowflakes and dinosaur bones for us to dig up. And most importantly, he invented a little boy on Boulevard Saint-Laurent who would be greatest figure skater and greatest kisser the world had ever seen, and he named him Raphaël Lemieux." — from The Girl Who Was Saturday Night, by Heather O'Neill. This is a fine example of how Heather O'Neill makes life a little more awesome. Early this month I started a reading a novelization of the life of George Sand. How is it that such an interesting historical figure could be rendered so mind-numbingly boring? With excruciating physical detail, that's how. They say it's the small details that bring historical fiction to life, but in such quantities they seem to deaden it. This is The Dream Lover, by Elizabeth Berg. Is this just a matter of the wrong book at the wrong time for me? Have you read Berg? I admit to having been charmed by one line: "I was thrilled by the way Jules made an intimate act intimate." I have picked up and put down this novel a couple times already. Maybe I'll try one more time. Maybe I won't. 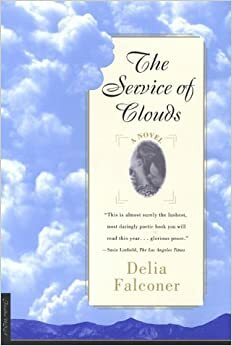 The Service of Clouds, by Delia Falconer, takes its title from the epigraph from art critic John Ruskin in "Of Modern Landscape": "if a general and characteristic name were needed for modern landscape art, none better could be invented than 'the service of clouds'." I'm not really sure what that means, nor what significance it has as this novel's title. Perhaps the novel is meant to depict an interior landscape, but it is decidedly not a modern one. It is a huge responsibility — one I rather dislike — to read a book pressed upon you by a friend who professes it to be among their favourites. This is not a book I would've picked up of my own accord. But once started, it's not one I would abandon, either — I was wholly interested to know how it would turn out. In fact, at its very best, it calls to mind the magic and awe I felt when reading Richard Powers' The Goldbug Variations and Mark Helprin's Winter's Tale, two books I think of fondly. The novel is, as advertised, "sumptuously poetic" and "seductively lyrical", but for my taste, excessively so. Many of the descriptions run on, and I would skip through them. Quite possibly because of this I have missed out on beauteous and nuanced observations of the human condition. When I recounted the terrible winter of 1918, I could not find the words to tell him how Mrs Grudge, who had been widowed two years by the war, was found in her chicken shed, her cheek flattened against the faeces and pellets on the floor. I remembered how Mr Medlicottt, just weeks before his own loss, had returned to the pharmacy to give an account of the post-mortem. He had stood behind the doctor as his government-issue scalpel made a red line from the tip of her chin down to the sparse triangle of hair below her belly. Before the muscle and the inner organs were revealed he saw pale beads of fat which spilled and gleamed. The voluptuousness, he said, had surprised him. Inside her womb the doctor had found a lump of tissue attached to a damp hand of chestnut hair, which he pulled taut with one hand while he detached the tumour with his knife. Springing from her belly, the growth bobbed from his gloved fingers like a shrunken head. When it was bisected there were two crude teeth caught like see pearls at its centre. The doctor dropped the flesh and teeth and hair into a jar of spirits and took them to a sandstone building in the university on Parramatta Road, islanded by the traffic which made its way into the city form the west. All that day I was haunted by the thought of those damp secrets unwound on the wooden table. What exactly is going on here? Something nefarious and sexual is implied here. Is it a baby, or a tumour? This is a fairly extreme example, but it demonstrates my overall impression of the novel. The language is cryptic, and the book wants to be thought clever — it's too clever to tell anything straight. It's like a poem that's deliberately ambiguous; it probably has something concrete to relate, but the more metaphor and symbol that can be packed in, the more important it sounds. Perhaps my judgement is so harsh because I did not like the heroine or find her romances wholly believable. Eureka Jones is a capital "R" Romantic, but ultimately I found her reserved and passionless even (especially) when she professed her heartbreak. At times there are weirdly sexual references. Is this novel a meditation on love? It is not even the story of a romance. It is the self-indulgent musings of a silly young woman, one with her head in the clouds. One who's learned everything about love from vaguely suggestive poetry. I liked this novel's opening, when it recounted the character's family histories. But it lost me when it spoke of love. I understand love and romance completely differently, in a much fuller, more passionate, more romantic way than poor stupid Eureka. She's found nothing. The story is set in Australia in the years leading up to and just after the First World War, when a lot of nations and individuals grew up. The main love interest photographs clouds and is based on real-life Blue Mountains photographer Harry Phillips. Clouds are a key motif throughout the text, but it could just as easily have been rock formations, botanicals, or photographic emulsions. There are no unicorns in this book, not really. The Gallery of Lost Species, by Nina Berkhout, has a picture of a unicorn on the cover. It looks like a real unicorn, too, not some childlike rainbow-prancing animation. Just as thirteen year-old Edith Walker is about to leave childhood behind, she thinks she spots a unicorn high on a slope while hiking. Her daydreamer father Henry convinces her that what she's seen is real. Edith's sighting of the fabled creature — and her unfailing belief that the imaginary creature will eventually be found — sets in motion a series of events that impact the next decade of her life. So for some reason I expected this book to be a quest for that unicorn. A bit of a fantasy novel, YA maybe. I wasn't sure I wanted to read this book. Fulfilling her father's wish for her to work in a museum, Edith takes a job cataloguing artwork at the National Gallery of Canada, where she meets an elderly cryptozoologist named Theo. Theo is searching for "Gauguin's mystery bird" and has devoted his entire life to tracking down extinct animals. [...] Edith develops an unlikely friendship with Theo when she realizes they might have more in common than she imagined: they are both trying to retrieve something that may be impossible to bring back to life. Aha! Cryptozoology. There's something I could sink my teeth into. But Edith doesn't go looking for the unicorn, she just remembers it from time to time. And the cryptozoologist is a fairly minor character. So this gallery of lost species consists of a unicorn, a bird, and Edith's sister. And maybe Edith herself, and Theo, and Edith's failed painter father, and her mother is certainly a species unto herself, who doesn't even know she's lost. Liam, who fell hard for Edith's sister, he's neither much of a species nor is he lost, though he's lost to Edith, who fell hard for him. I feel like I was tricked into reading this book. Like when my mom is watching TV and some movie's just starting, and she tells me to come watch with her, it's such a nice movie, but I don't really feel like it. But she tells me the title and its sounds vaguely familiar, like something that may have interested me once upon a time. And I start watching it from where I stopped midtrack crossing the living room, and then I perch on the arm of the sofa, and before you know it I'm curled up beside my mom with a blanket and the tears are streaming down my face, and I'm thinking, this is not a nice movie at all, it's not what I thought it was at all. This book is like that. I got sucked into Edith's childhood, living in the shadow of her sister, living in the whirlwind of their crazy mom, and wondering why their parents were even together, they're both of them so weak in their different ways. And then they're teenagers, and the drugs start, and the sister leaves and goes to the other side of the country, and she just can't keep it together, and the alcohol, and barely making ends meet, and people die, and life just happens, and it's so sad and depressing, she's a lost cause, and they're all doing stuff for the wrong reasons, they're so screwed up. So it was a good book, in that it was entirely compelling, I couldn't wait to find out what happened next. But had I known what it was all about, it's not the kind of book I would've picked up. I still kind of wish there'd been an honest-to-goodness unicorn quest in it. "You're mistaking happiness for unhappiness. That's why the French are so melancholic. Everything beautiful makes them cry. They invented existentialism as an excuse not to love their wives." When I was 17, I would ride the bus up to the university. For art and culture. By myself. I'm not sure why I thought that would be a cool thing to do. Certainly I enjoyed it, but I suspect it was something I felt I ought to do, in order to become the person I thought I wanted to be. I didn't tell any of my friends. I don't remember what I told my mother — she would've been supportive of the endeavour in theory, but horrified that I was going alone. I must've lied. So I was 17 when I first saw Jean-Luc Godard's Prenom: Carmen. Which I'd wanted to see because I liked Carmen, the opera, the story. What did I know? So I was 17 when I first heard Beethoven's String Quartet No. 15 in A Minor, when I first heard it in a significant way. In that movie. I was 17 when I studied T.S. Eliot's Love Song of J. Alfred Prufrock, and wrote a response. I was 19 when I first encountered the Four Quartets. When I met David. When he brought me Beethoven's Late Quartets. Last weekend I saw the Emerson String Quartet perform No. 15 in A Minor at Bourgie Hall. It was perfect. It's one of the sexiest pieces of music I know, the way it breathes with exquisite anticipation. In the end, it's all me. I've always used my real name. Why wouldn't I? I have nothing to hide. Last weekend, though, I came to the stark realization that "I have nothing to hide" is a vulnerability in the armour of freedom I wear so brazenly. It can be used to undermine my right to privacy. Everybody has something to hide. And I'm prompted, what if you're applying for a certain job, what if there's a regime change in 5 or 10 years' time, what if. So let me say instead: I stand by all I say and do. I have nothing I should ever have to hide. From Anonymous to Edward Snowden: Hackers as Activists, was a fascinating discussion, part of this year's Blue Metropolis International Literary Festival, moderated by Will Straw and featuring anthropologist Gabriella Coleman (@BiellaColeman)and Ubisoft content director Thomas Geffroyd (@Orph30), who worked on Watch Dogs, a game about a hacker. On my way out to the event, I continued reading Satin Island, by Tom McCarthy, and I was just at the part where Petr was telling about people hacking down the Berlin wall. I was jarred by the use of the word hack — here it was starkly physical, people chiseling and chipping away at this massive physical structure, which itself was a mere symbol of something much stronger and vaster, something social and political, some great divide. And this word was buried in this tiny account which was surrounded by talk of U's company's Project, his growing fantasies of vandalizing the Project and its associated structures, of sabotaging it by feeding faulty data into the Project. That word, "hack," is a loaded word. To cut, to cough. To cope, to loaf. To work as a mercenary, to work in the service of mediocrity, to sell out. As regards the technological connotations, see Ben Yagoda's A Short History of Hack. Hacking has a long and proud history that depends on craft and craftiness, with the intent of repurposing machines to do things they weren't designed for. It has its own tradition and folklore; this is evident in naming practices, and Coleman gave the example of UNIX, which was based on the overly complex Multics, in effect castrating it, and thus its name memorializes the condition of its birth. Hackers tend to combine tech savviness with a touch of compulsive disorder. They have a highly developed sense of humour, hence Easter eggs. They take pleasure in breaking (into) things, just to see if they can. Which gives them the knowhow to build better things. They work as system administrators and security researchers. Hacking embodies a counter-cultural, antiestablishment spirit. The idea of hacktivism then takes up the cause of freedom, free speech, free access, and freedom of information. And that's a good thing. How could it not be a good thing? Geffroyd made the point that we're very quick to give up our freedoms in North America. For a continent founded on the principles of liberty, it's easy to convince us that the greater good outweighs our individual rights. This is not so true in Europe (Germany is one of the biggest defenders of personal privacy), and he surmises that this is the legacy of World War II, which Europeans still live with in a relatively immediate way. Take for example the Gestapo, who used government files to identify Jews; the Stasi, who used surveillance and other techniques to identify dissidents. Europeans know firsthand the terror and danger of the surveillance state. Whether or not I have anything to hide, I should never have to hide. It was a provocative hour; there was no time for an in-depth analysis of today's privacy issues, or WikiLeaks, or the infiltration of communication networks. But it definitely opened my eyes to the interconnectedness of many of these issues, and confirmed for me that I need to take responsibility for being better informed so I can be a better citizen. Anonymous: The Masked Avengers in The New Yorker. The need to ensure free speech and privacy for lawyers, activists, and journalists. The Five Eyes, an alliance that shares intelligence, in circumvention of domestic privacy laws: About. Copyleft, copyright that guarantees free distribution terms. Pretty Good Privacy (PGP) data encryption: About. Tor, for preserving anonymity online: Download.